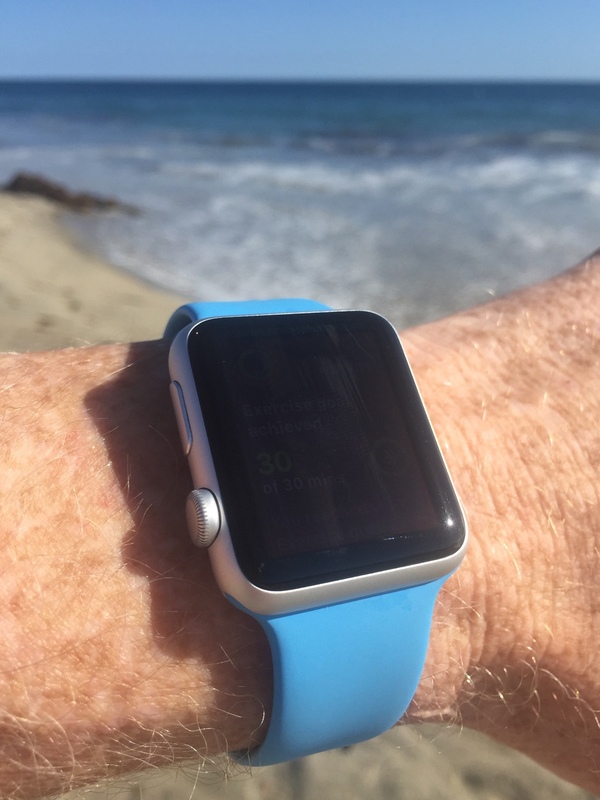 Everyone from followers on Twitter to Laguna Beach lifeguards have noticed that I wear my watch while swimming and want to know how this new device holds up when it comes in contact with 71% of the Earth’s surface. If you look closely, you’ll see that I just completed my exercise goal with a swim in the Pacific Ocean. The first thing I wanted to know after the Apple Watch announcement was its water resistance. Swimming is my favorite way to work out, so I knew I’d want to use the watch in the water. But there wasn’t much information available other than Tim Cook saying he wore his in the shower. Submerging Apple Watch is not recommended. Apple Watch has a water resistance rating of IPX7 under IEC standard 60529. The leather bands are not water resistant. Water resistance is not a permanent condition and Apple Watch cannot be rechecked or resealed for water resistance. A little bit of research shows that “IPX7 under IEC standard 60529” means the watch can be submerged in 1 meter (3.3 feet) of water for up to 30 minutes. That’s certainly more than a shower and perfect for the kind of swimming I do. After the watch shipped, I discovered that I wasn’t the only person interested in the watch’s ability to be used during swim workouts. Ray Maker at the DC Rainmaker blog did a series of tests, including diving off a 10 meter (33 foot) platform and 40 meter (130 foot) pressure test. The Apple Watch passed these tests with flying colors, and along with the research below, I was convinced I wouldn’t have any problems. So far, that analysis has proven correct. I suspect that the watch’s water resistance has been undersold by Apple just like battery life: it’s better to under-promise and over-deliver. Still, it’s a personal decision on whether you want to ignore Apple’s recommendation. You’re not likely to get much sympathy at any subsequent trips to the Genius Bar. 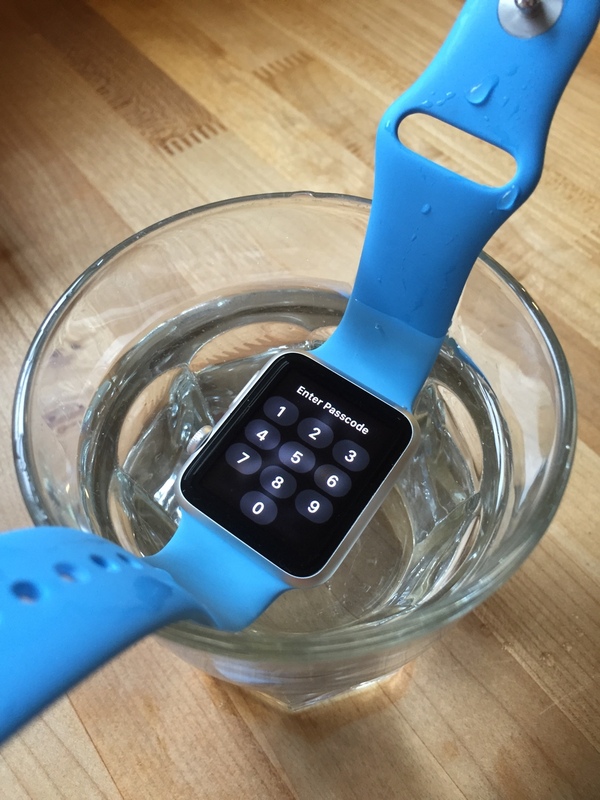 Now that we know the Apple Watch can go in the water, how does it work while submerged? Water and electricity don’t mix. Anyone who’s dropped an iPhone in the toilet knows this. But what is the cause? On its own, water is an insulator which does not conduct electricity. You can drop any electronic device in 100% pure water and the only damage will be the components getting wet; everything will continue working, even while immersed. When electrodes are placed in an electrolyte and a voltage is applied, the electrolyte will conduct electricity. Lone electrons normally cannot pass through the electrolyte; instead, a chemical reaction occurs at the cathode, consuming electrons from the anode. Another reaction occurs at the anode, producing electrons that are eventually transferred to the cathode. As a result, a negative charge cloud develops in the electrolyte around the cathode, and a positive charge develops around the anode. The ions in the electrolyte neutralize these charges, enabling the electrons to keep flowing and the reactions to continue. In effect, water is trillions of microscopic wires that can fry any electronics they touch. The amount of material in the water which causes electricity to flow is related to the number of Total Dissolved Solids (TDS) in solution. The conductivity itself is measured in Siemens per meter (S/m). Deionized water has a very low TDS and conducts at about 5.5 μS/m. Drinking water is about 1,000-10,000 times more conductive at 5-50 mS/m. Water in the ocean is about a million times more conductive at 5 S/m. Chlorinated water, especially when coming from a salt chlorine generator, has mineral content (TDS) and conductivity that’s much higher than plain tap water. The bottom line is that water in your public or residential pool, nearby beach, or even the tap in your bathroom can conduct electricity. And that has some major implications for the Apple Watch. Like other iOS devices, the Apple Watch uses a capacitive touchscreen. Using our bodies as a conductor, the screen senses changes in capacitance using an electrostatic field that surrounds the display. When you surround your body and screen with a conductive liquid, that dynamic is shot to hell. Unless you’re swimming in distilled water, the touchscreen on your Apple Watch just won’t work. Try using the touchscreen like this and you’ll start to understand a fundamental problem with Apple Watch. Interestingly, the San Francisco Bay Area has some of the cleanest municipal water in the United States. The water in Silicon Valley literally comes from a pure mountain stream that is free from sediments. Most of us aren’t so lucky: if you’re trying this test in Cupertino, try dissolving a little salt in the water first. The touchscreen isn’t the only thing that stops working: the watch’s Force Touch feature is blocked by software. Any pressure on the screen’s sensors is ignored unless there’s corresponding touch registered on the display. You can test this for yourself by placing an insulator between your finger and the watch’s screen (I used a wooden spatula.) No matter how hard you press, nothing happens until you remove the capacitance barrier. We’ll explore the usability implications of these shortcomings after learning a little more about water. The electrochemical process that causes conductivity in water also causes corrosion. Anyone that’s spent time in or around the ocean knows that anything coming in contact with sea water gets cleaned with fresh water. So how does the Apple Watch hold up under these conditions? Note: The following research is focused on the Apple Watch Sport. The other models use different materials for both the case and display face. I suspect most people who are interested in using their watch in water will own the Sport model. Also, experimentation is much easier to justify with the cheapest watch! The case of my Sport watch is anodized Aluminium. The anodizing process causes a very thin (2-3 nm) protective layer to form. That layer is non-conductive, providing good electrical and corrosive protection. My multimeter shows over 6 MΩ of resistance between the speaker and microphone ports on the watch. The protective layer is also very tough. My experience with the anodized case shows this is true: after several months of abuse, it’s still scratch-free. The display uses Ion-X glass, which is used in the windows of space shuttles and high-speed trains. Suffice to say this glass is pretty tough stuff. Glass is also an excellent insulator: high-voltage power distribution uses glass and other ceramics to prevent current from passing through power lines to the ground. Obviously, the Apple Watch is not a solid piece of anodized aluminium or Ion-X glass: there are gaps between these materials. In these spots, you’ll find CHOCK’s favorite material: Rubber. Apple hasn’t said anything about this important material. For example, we don’t even know if it’s a natural or synthetic rubber. All we know is that it’s there: the teardowns of the Apple Watch by iFixIt provides some valuable insights. An example of the rubber gaskets used to protect the Apple Watch from water intrusion. Another good place to see these gaskets is when iFixIt removes the diagnostic port cover. The X-ray of the digital crown also shows several bushings that are likely to act as water barriers. You might think that rubber would be a weak point in the watch’s fight against the intrusion of water, especially when it’s highly corrosive salt water. It’s a weak point, but not for environmental reasons. A severe deterioration of properties requires impracticably long time periods. Make sure you rinse your equipment in fresh water after it has been exposed to salt water. As you’ve seen above, that includes a swimming pool. I make sure to wash my watch thoroughly after every swim. It doesn’t take much to get the corrosive liquid off. If you’re working out, it’s likely that you have a bottle of water handy: a few splashes is all it takes. Don’t use a sports drink for this rinse: it contains the same harmful electrolytes you’re trying to get rid of! Chances are also good that you’re going to take a shower after a workout. Just hold your wrist up to the shower head and you’re done! One thing I’ve noted after getting out of the ocean is the digital crown feeling a little “gritty” while being turned. My guess is that some small grains of salt or sand are getting between the crown and the case body. This friction goes away as soon as I rinse the watch and underscores the importance of keeping it clean. If you wear your Apple Watch in water, rinse it off when you get out. Once you start getting in the water with your watch, you’re going to want to start tracking activity. Unfortunately, the only category in the Workout app that can be used is “Other”: there are no indoor or outdoor swim workouts available. Given Apple’s cautious approach to water, that’s understandable. The first few swims of the season are always a little tough: they’re short because my muscles burn out quickly. I’m also not swimming as hard, so fewer calories get burned. There is some variance in the readings due to water temperature: on cold days I swim harder for a shorter time (to keep the body’s core temperature up.) Missing days are because the water was below 67 °F and I don’t swim with a wetsuit. You’ll also see in the next section that it’s hard to accurately time a swim. I rounded off to the half minute in the table above, but even then some measurements may be off by a minute or more. I calculated the Cal/Min metric to check how consistent the workout tracking is in water. From what I see, the Apple Watch has no problem tracking activity in water. I haven’t seen the watch lose skin contact and lock during a swim workout; another good indicator that the heart rate sensor is staying put and doing its job. For an ocean swim, this screws up your timing: you don’t really start swimming until after you get beyond the surf break. If there’s heavy surf, this can take several minutes. Workout data is being collected while you’re standing and waiting for waves to clear. This delay can also make it difficult to measure your progress: I know how long it takes to reach several landmarks along the coast. If a minute or two is added at the start, I have to mentally adjust the timer readings. Another frustration in the Workout app caused by water: the movement of a conductive liquid can fool the app into registering a swipe that takes you from the timer to the calorie display. Sometimes you can tread water and blow on your watch and finger until a swipe is registered, but this is very disruptive to the workout. This video is also a good demonstration of the difficulties swimmers have with a touchscreen. Pressing the digital crown is the only way to reliably interact with the device. Since using the watch in water is not recommended, Apple may choose to reject swimming apps. Given the inherent difficulties of using a capacitive display in an electrolyte, we may be waiting a long time. There is another source of mineral-rich liquid that affects the Apple Watch’s performance: perspiration from your body. And any good workout means that there’s going to be plenty of it. Your sweat glands love to pump out conductive electrolytes that are going to mess with your watch. Even if you’re not in a swimming pool, you’ve probably experienced the Apple Watch’s erratic behavior during a heavy workout. If you haven’t, try wiping your finger across a sweaty brow and then interacting with the touchscreen. Runners and cyclists, welcome to the swimmer’s world. Sports drinks are a popular way to replace essential fluids lost during a workout. These drinks contain electrolytes, and as we’ve seen, they’re not good for your electronics. Keep these drinks away from your watch! Water is heavy. At room temperature, it weighs in at about 62 pounds per square foot (9.8 kN/m³). As you descend in water, all of the water above you exerts a downward pressure force. For every meter of water, there’s about 1.4 pounds per square inch (psi) of pressure. The deep sea research vessel, Trieste, gives you an idea of the extreme engineering challenges presented when there’s 35,797 feet of water above you. We saw above that rubber is a hearty material when it comes in contact with corrosive liquids. The danger rubber faces in water is due to hydrostatic pressure; at 40 meters (120+ feet), about 57 psi is exerted. Imagine a seven year old child standing on the face of your Apple Watch: that’s about the same amount of pressure force on the watch. Our bodies don’t feel the same pressures because we’re basically bags of fluids that equalize with the surrounding water. The pressure force is more pronounced in hard materials, such as those used in the Apple Watch. The softest material, rubber, is also the one most likely to fail because of its flexibility. One downside to Apple Watch not participating in this water sport: my activity rings looked like I’d been resting comfortably all day, despite burning thousands of calories. Keeping your core temperature up, even in warmer waters, burns a lot of energy. Now that we’ve seen how the Apple Watch handles water, let’s take a look at how Apple’s engineers could improve things. The only way to launch the Workout app is from the watch home screen. Siri won’t work because your iPhone doesn’t like to go near water! Workouts are started by tapping, swiping and tapping again. Workouts are stopped by force press, tapping, swiping or scrolling, and then tapping again. All of these things are extremely hard to do when the screen is wet. I’m convinced Apple’s recommendation to not use the watch in water is because of the erratic behavior it causes. My biggest complaint about the Workout app is its usability at the end of a workout. There is a lot of pressing and navigation at a time where your muscles are barely working, your whole body is moving as it tries to replenish oxygen in your lungs, and blood is rushing to your head. You’re not at your best, yet the app requires some significant mental and physical gyrations. First, you have to force press to get the “End” button. If your hand is sweaty or wet, this action is difficult to trigger because electrolytes are defeating the touch sensor. Then you have to remember that pressing “End” really isn’t the end of your workout. I’ve had to explain this behavior to more than one person who’s wondered why the activity isn’t displayed on their green ring. It’s not obvious there’s a “Save” button because it’s at the end of a long list of data you couldn’t care less about at that moment (your main challenge is to stay upright!) If your hand is wet, getting to the end of that list means you have to use the digital crown, but fine motor skills are lacking, so even that’s hard. Now you have two buttons to press: one is good, the other discards some data you worked very hard to get. These buttons are placed next to each other and your motor skills are impaired. If your hand is wet, you’ll have to tap several times, increasing the chances of destroying your data. After you finally hit “Save” you get kicked back to the home screen. Just like when an app crashes. Every time I’ve saved a workout, I immediately go back to the app to verify the data was recorded. I have no trust in the app even though it’s worked reliably for months. Adding to these challenges is bright sunlight. The OLED display is beautiful and easier to read outside than an LCD display. But even though it’s better, the display is still hard to read during an outdoor workout. Given Apple’s legendary secrecy, it wouldn’t surprise me if a lot of the watch’s development and testing was done in a gym. I find the display much more comfortable to use during an indoor cycle than an outdoor run. Taptic feedback feels like a lost opportunity here. For a timed workout, give me a tap on the wrist at five minute intervals (which would also act as a nice reminder if you forget to end a workout!) Calorie-based workouts could give you feedback when you go above or below a target range. These kinds of feedback mechanisms would benefit all kinds of workouts: you can focus on your workout more by looking at your watch less. As we saw with diving, there are some workouts where you shouldn’t bring your watch. Why can’t activities like these be entered manually? If you know a diver’s size, the depth and time of the dive should be enough information to approximate the number of calories burned. I can’t see Apple adopting another type of touchscreen sensor technology: capacitive devices work flawlessly in the vast majority of cases. But as we’ve seen, there are some very real problems during all types of workouts. Going forward, the only solution I can see to these problems is some kind of physical button. Given the history of other iOS devices, I also don’t see Apple adding buttons to the case design. Runners and cyclists don’t want to poke at their wrists to get a lap time or mark the end of a workout. It’s cumbersome and potentially dangerous to take your eyes off the road. Swimmers don’t even have the option of diverting their attention. Like taking a photograph, a workout is a special mode in your life. I can’t imagine a use case where you’d want to use Apple Pay during a workout. Likewise, sending a heartbeat to a friend during a workout would make them think something was seriously wrong with you. If you feel the need to text someone during a workout, you need to re-evaluate your strategy for good health. Athletes have been using chronographs to track their progress since it was possible to put time in your pocket. I think it would be wise if Apple Watch took some cues from the physical interactions we use on a stopwatch. I hope the information in this report will help others understand what the watch can and cannot do in the presence of water. I also hope my experiences will help Apple improve the watch’s capabilities for swimming workouts. In the meantime, look for me and my Apple Watch here. Ever wonder what developing for the iPhone was like before the SDK shipped with iOS 2.0? I really enjoyed talking with Mark Bramhill and reminiscing about these early days. I just released the source code to my first Cocoa app. You have no idea how embarrassing it is to reveal this code, but I hope it goes to show that we all have no fricken’ clue at various points in our lives.